OAKLAND PARK, FL – It’s hard to believe that it’s already been a year since Funky Buddha Brewery first opened its doors in June, 2013. With its first anniversary set for May 31, 2014, the brewery is ready to celebrate with a day-long festival of live music, the area’s best food trucks, and dozens of its own brand of culinary-influenced beers. Now, as year two looms, Funky Buddha is in the midst of a three-million dollar expansion featuring new equipment, a larger space, and bottles of its unique and innovative beer on the way this fall. The 2014 Rate Beer Best named Funky Buddha among the top 100 breweries in the world, while Maple Bacon Coffee Porter (the release of which drew 4000 people to the brewery in January) and Last Snow Porter named “Top 5” porters in the world. As exciting as year one was for Funky Buddha, its second operating year promises to have much more in store. Namely, the brewery is undergoing an expansion that will see it become the largest craft brewery to produce and bottle its beers here in South Florida. This comprehensive expansion began in March with three new 120 barrel tanks from Portland, Oregon-based Metalcraft Fabrication, which are being used exclusively to produce flagship beers Floridian Hefeweizen and Hop Gun IPA. Two more of these towering, 4000 gallon tanks are slated to arrive in July, increasing Funky Buddha’s annual capacity to over 16,000 barrels. To package all of that beer, Funky Buddha will install a custom-designed bottling line from CFT in Reggio Emilia, Italy. Arriving in late July, this state-of-the-art line will have an output of 100 bottles per minute, and will allow Funky Buddha the speed and flexibility to continue to grow in its current Oakland Park location. This equipment will mean the launch of 12oz glass bottles in August, which will be distributed via Brown Distributing to on- and off-premises retailers statewide. The launch will initially include six packs of the brewery’s core line up of Floridian Hefeweizen, Hop Gun India Pale Ale, and Crusher Session IPA, as well as a line of culinary-influenced brands such as No Crusts Peanut Butter and Jelly Brown Ale and Sweet Potato Casserole released bimonthly in four packs. Limited release 22 ounce bottles will follow in November, with barrel-aged brews, berlinerweiss, and other specialty releases on the slate. Finally, to house that equipment, Funky Buddha recently signed a lease on an additional 21,000 square feet of space adjacent to the original brewery. Aside from allowing the brewery with the operational space to grow, the new wing will also feature offices, cold storage, and the space vital for the brewery to expand to its goal of 40,000 barrels produced annually. 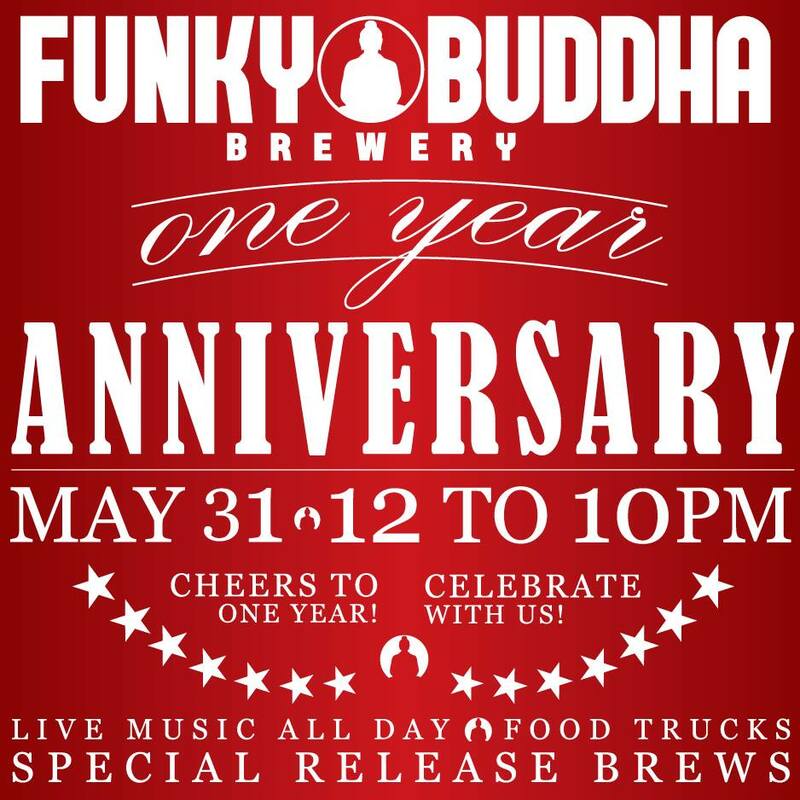 To celebrate its achievements and toast to future goals, Funky Buddha will host a One-Year Anniversary Celebration on May 31 from noon to 10pm. This festival will feature all the festivities Funky Buddha fans have come to expect, including live music and painting from prominent local artists, an assortment of the area’s most creative food trucks, and of course a plethora of limited release beers including old favorites and new creations. More information on our upcoming package launch, including product renderings and ship dates, will arrive mid-summer. For further details on the Anniversary Festival, please visit funkybuddhabrewery.com.